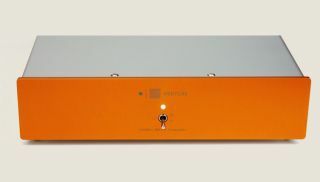 Vertere launches Phono-1, its first phono pre-amplifier | What Hi-Fi? Vertere's first phono stage is a suitably plush affair - it's made in the same London workspace as its turntables, and uses hand-selected, premium components. Vertere is known for its high-end turntables, and now it's launched the perfect accessory to go with them - its first phono stage. Like other phono stages, the Vertere Phono-1 amplifies a record player's miniscule cartridge signal a thousand-fold while trying to minimise distortion. The Phono-1 was built in Vertere's London workspace (where its turntables are also made), and uses hand-selected, premium components intended to deliver great accuracy while tracking the RIAA curve. It has more than 10 gain settings for both moving magnet and and moving coil cartridges. There are also 15 resistance and nine capacitance settings for left and right channels, with seven of the latter designed especially for moving coils and their associated frequency lifts of over 10kHz. Plus it has a three-way phono PCB ground management switch. This should help achieve the lowest 'earth hum' in pretty much any set-up. Of course, this kind of performance comes at a price. The Phono-1 costs £1,000, and is available now. For more info, check out the brochure.